DigElogROCORI: DigElogROCORI... WHAT IS IT? IT’S ALL THREE IN ONE! DigElogROCORI local stories (Rockville, Cold Spring & Richmond, MN) will be covered using three distinct internet media forms. The terms you hear more commonly include newspaper, radio and television. On the internet these three terms are replaced with Blog, Podcast and Vlog. A weblog usually shortened to BLOG is a web-based publication consisting primarily of periodic articles (in reverse chronological order). The BLOG not only creates timely stories and information, but also enables visitors to leave public comments, which lead to a community of interactive readers. The DigElogROCORI site will allow immediate reaction and interaction by readers on the stories that matter and affect our lives most. When available, numerous photos will be interlaced throughout the BLOG story entry to enhance understanding and reader interest. Podcasting is a method of publishing audio broadcasts via the Internet, allowing users to subscribe to a feed of new files that automatically download onto portable players, telephones and personal computers. DigElogROCORI PODCASTS will include everything from sporting events, special interest stories, and important government and school meetings. A VLOG (short for videoblog) is a blog which uses video as the primary content. 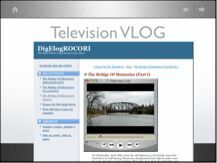 Each week a series of short video stories will be published on DigElogROCORI. Similar to Podcasts, Vlog entries can be downloaded onto all sorts of portable players as well as personal business and home computers. Larger audio and video files are downloaded onto the chosen device using a subscription or RSS feed process. The downloaded media files are available for immediate viewing at the convenience of the user. 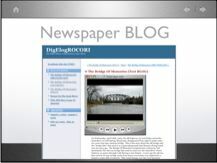 Your DigElogROCORI takes advantage of RSS (Really Simple Syndication) for subscription and syndication of its web sites. 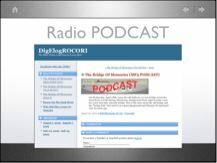 Using free aggregator software (rss readers) like “iTunes”, “FireAnt” and “IPodderX, your daily DigElogROCORI articles, radio programs and videos will be automatically downloaded onto you computer for viewing at your personal convenience. The DigElogROCORI site also archives all files for future access to any previously published file. To subsribe or for other assistance check out this link. Duane - this is a great explanation of new media. Also, I like the open of your videos here. All hail DigElogROCORI!